Before her journey to overcome infertility, Jeanette Firpo watched someone close to her deal with similar issues. She observed this person suffering from the side effects of powerful hormone injections to encourage ovulation, endure the expense of what was ultimately unsuccessful in vitro fertilization (IVF) and grapple with the moral implications surrounding embryos that were conceived but never implanted in the womb. Mrs. Firpo felt fortunate that she had learned about another option. Her baby daughter, Laila, was conceived after Mrs. Firpo and her husband, Jessy, were diagnosed and treated by doctors using Natural Procreative Technology (NaProTECHNOLOGY) techniques at CHS’s Gianna Center of Long Island. “At the Gianna Center, we practice restorative reproductive medicine (RRM) and surgery,” said Medical Director Paul Carpentier, MD, CFCMC. RRM is a holistic approach that focuses on pinpointing the underlying cause of infertility. Once the cause is identified, doctors recommend medical, surgical and nutritional methods to restore the capabilities of the reproductive system. In contrast, commercial IVF clinics use a one-size-fits-all approach to conception, often without uncovering the underlying problem. 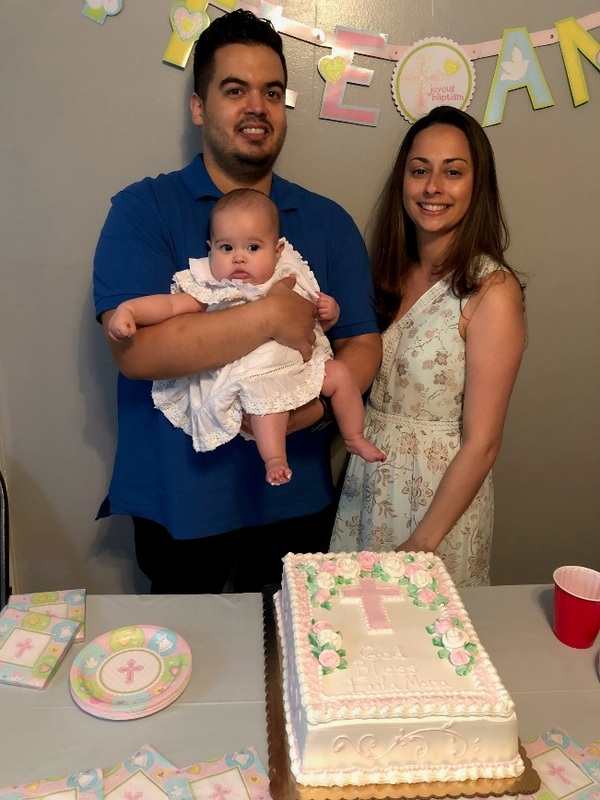 Gianna Center patients Jesse and Jeanette Firpo recently celebrated their daughter Laila’s christening. Mrs. Firpo was found to have severe endometriosis, which affects up to 80% of women experiencing infertility, according to Dr. Carpentier. Endometriosis occurs when the tissue that normally lines the inner uterus grows outside of the uterus in the abdominal cavity, causing pain and scarring. Mrs. Firpo underwent minimally invasive robot-assisted surgery to remove the endometriosis. Good Samaritan’s Chief of Gynecologic Oncology Pankaj Singhal, MD, who is experienced in using the surgical robot, performed the delicate operation to remove the endometrial tissue from deep within the abdomen. At the same time, Dr. Carpentier prescribed medications, supplements and vitamins to help stabilize Mrs. Firpo’s immune system, sleep cycles and nutritional status, all of which also contributed to her infertility. He identified an endorphin deficiency—an easily treated yet often overlooked problem that causes individuals to be extremely sensitive to pain, disrupts their sleep and triggers severe menstrual symptoms. Mr. Firpo was also evaluated and treated with supplements. A critical part of the Firpos’ journey was learning to observe the ovulation cycle, thereby identifying peak days for conception to occur. IVF centers require frequent laboratory testing to predict ovulation, but by learning simple techniques at the Gianna Center, Mr. and Mrs. Firpo were able to avoid costly, invasive lab tests. Located in Babylon, the Gianna Center is the only facility of its kind on Long Island. Patients from around the country are drawn to its comprehensive, holistic approach to treating infertility, as well as its conformity with the teachings of the Catholic Church. It is worth noting that 2018 is the 50th anniversary of Pope Paul VI’s prophetic encyclical Humanae Vitae, in which the Pope encouraged couples to embrace married love completely. The document provides authentic moral guidance for those in authority, couples, clergy, scientists, doctors, nurses and others, regarding questions pertaining to fertility, parenthood and married life. The Gianna Center is a response to that call. “The Gianna Center offers a unique opportunity for residents of Long Island and beyond to restore normal anatomy and physiology without being subjected to artificial chemicals,” said Dr. Singhal. The combination of faith and medicine was a winning strategy for the Firpos. Just two months after the surgery, they learned that they were expecting. For information about the Gianna Center of Long Island, please call (631) 376-3232. To read Humanae Vitae and the commemorative pastoral letter of Most Rev. John O. Barres, Bishop of the Diocese of Rockville Centre, please visit the Resources page at www.chsli.org/gianna-center-long-island.